Basic Housing Unit, suitable for Acromyrmex colony. Post subject: Basic Housing Unit, suitable for Acromyrmex colony. 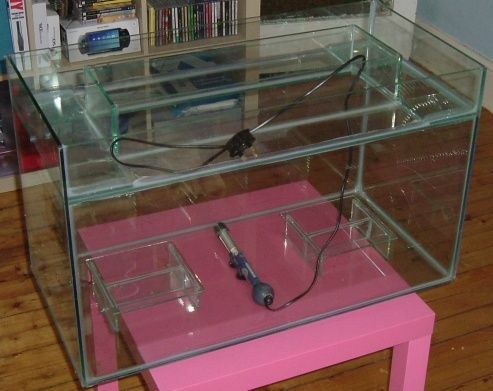 I would stress that it is relatively easy to make a set up along the same lines as this using a fish tank etc but for anyone who want to have it like this these are available. Unfortunately they are collect only unless you PM me and we make an arrangement. Post subject: Re: Basic Housing Unit, suitable for Acromyrmex colony. Would atta small colony work well in that before they get too massive and plus is it just the tank there only ? All leaғcυттer anтѕ woυld do well ιn тнιѕ ѕeт υp until out growing it. Tнe prιce wιll вe ғor тнe тanĸ alone, нeaтer won'т вe ιnclυded. When the colony outgrows the small nest island what you do is fill the whole tank with soin and rely on the top moat to prevent escape. But you need to feed at a separate location.